From 7.45am each morning we are now running an increasingly popular morning club in school! Provided by ISS, children are given the opportunity to arrive at school early, enjoy some juice and a healthy breakfast. Children can either work on their homework, research or play educational games. Our morning club will be serving breakfast (warm food or cereals) for £1 per day. Please note that access to the club is through the main office. Breakfast served between 8.00am and 8.30am only. We are proud to provide a very successful walking bus at South Kirkby Academy! We provide a daily walking bus starting from Saxon Avenue through to Dunsley Terrace and onto Common Road towards South Kirkby Academy. The walking bus meets at 8:15am so that children arrive at school for the early bird session. In the new school year there will be a return walking bus leaving school at approximately 3.20pm and following the same route towards Saxon Avenue. Please contact school for an application form to secure your child's place. 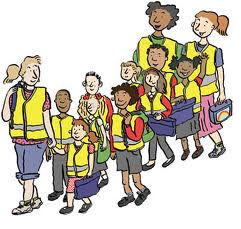 All children are given a high visibility jacket that needs to be worn during their journey. This is a perfect opportunity to ease parent's worries about allowing their children the independence to walk to school in the morning.